CATHOLIC GIFT SHOP LTD - Men's Lourdes Gift Set. The bottle measures 6 cm tall approx and may differ from the picture. 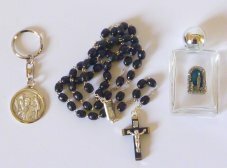 Black rosary beads, The centrepiece depicts the scene of the apparitions.